President Donald Trump signed an executive order on March 21 instructing colleges across the nation to protect free speech on their campuses—or else risk losing federal research funding. At the conference, Trump said it will be “very costly” if universities do not comply with his order. The government awards universities more than $30 billion annually in research funds. Trump’s order applies to certain education grants and won’t affect federal financial aid that covers tuition and fees for students. Specifics on how the federal government would enforce the order were not given by the senior official, who said the details would be figured out in the next few weeks and months. The order also directs the Department of Education to expand data available on the department’s College Scorecard, including program level earnings, debt, and loan default and repayment rates, in order to better help students. The Trump administration said they will “explore options” to find a common-sense approach to the mounting problem of student debt. 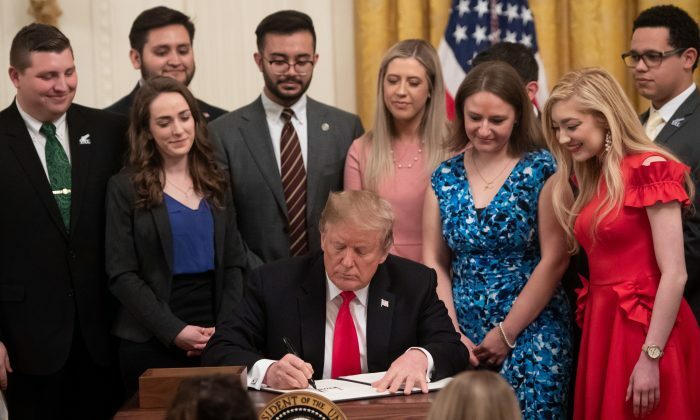 Trump’s executive order will not just give a voice to conservatives, but help to fundamentally change the culture on campuses, Anna Paulina, the director of Hispanic engagement at Turning Point USA, told The Epoch Times in a phone interview. In one incident at the University of Virginia, Paulina said, a group on campus coordinated a protest against Turning Point USA, with about 30 to 40 participants. She said the group made flyers with her face on them and physically intimidated her.